Harris M/A-Com P7100 IP VHF 136-174 Mhz EDACS Trunking Full Keypad P25 Digital. 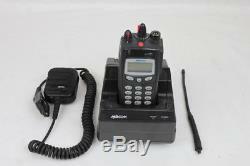 M/A-Com Harris VHF portable radio, model number P7100IP (OWDDTR-0013-E). This is a 5 watt, 1024 Channel radio with a band split of 136-174 Mhz. Radio is in great shape and is guaranteed fully operational. Radio is capable of Conventional operation, P25 Digital Operation and EDACS trunking operation. Unit comes with charger, antenna, battery and speaker mic. All units have been bench checked and guaranteed full operational. Free programming is available (1-16) channels. Radios feature codes are listed below along with the complete list of radio features available. 01 07 08 09 10 12 23 33. 01 Conventional Priority Scan 07 EDACS/P25 Dynamic Regroup 08 EDACS/P25 Emergency 09 Type 99 Encode and Decode 10 Conventional Emergency 12 Digital Voice 23 Narrow Band 33 P25 Common Air Interface (CAI) P25 Conventional. The item "Harris M/A-Com P7100 IP VHF 136-174 Mhz EDACS Trunking Full Keypad P25 Digital" is in sale since Thursday, February 22, 2018. This item is in the category "Business & Industrial\Facility Maintenance & Safety\Surveillance & Alarm Equipment\Two-Way Radios".